Heat stock, salt, pumpkin, onion, thyme, rosemary and garlic. Bring to a boil, reduce heat to low, and simmer for 30 minutes uncovered. * Ground spices will do just as well. Return to pan, and bring to a boil again. Reduce heat to low, and simmer for another 30 minutes, uncovered. Stir in Coconut Milk. Pour into soup bowls and garnish with fresh parsley or fried sage leaves. 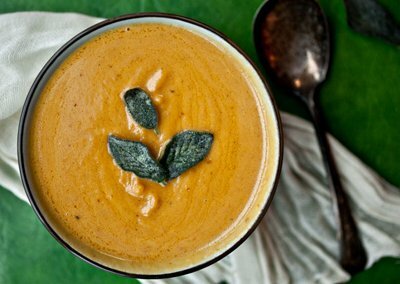 Although Pumpkin is a Winter Squash and normally not used as a Plan A vegetable, Libby’s canned pumpkin has 4 net carbs per half cup, which is approximately what you will have in a bowl of soup.